New York: Simon & Schuster, 1996. Octavo, original illustrated wrappers, illustrated. Signed by James Watson on the title page. In fine condition. Foreword by Sir Lawrence Bragg. The Annotated and Illustrated Double Helix. Norwalk, CT: The Easton Press, 2013. 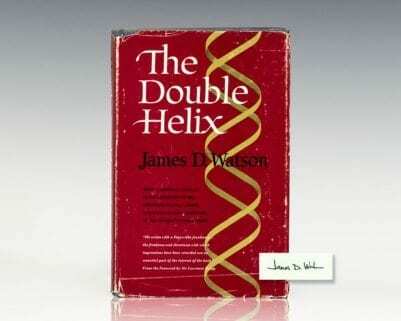 Signed limited edition of the annotated and illustrated Double Helix. Quarto, original leather. Signed by James D. Watson. Fine in a fine slipcase. Edited by Alexander Gann and Jan Witkowski. Watson, James D; Francis Crick; Maurice Wilkins; Arthur Kornberg, Joshua Lederberg. Nobel Lectures: Physiology or Medicine 1942-1962. Amsterdam: Elsevier Publishing Company, 1964. First edition of this collection of Nobel Lectures in physiology or medicine from the years 1942-1962. Thick Octavo, original yellow cloth. Signed by all three Nobel Prize-winning scientists Francis Crick, James D. Watson and Maurice Wilkins on the title page. They were awarded the Nobel Prize in Medicine in 1962, “for their discoveries concerning the molecular structure of nucleic acids and its significance for information transfer in living material.”Fine in a very good dust jacket with some closed tears and toning to the spine. An exceptional piece signed by these Nobel Prize-winning scientists. Watson, James D. & Andrew Berry. DNA: The Secret of Life. First edition. Octavo, original cloth. Signed James Watson on the title page. Fine in a near fine dust jacket. First edition of Watson’s ground breaking work regarding the discovery of DNA for which the author, Francis Crick and Maurice Wilkins were awarded the Nobel Prize in Medicine in 1962. Octavo, original blue cloth, with numerous diagrams and photographic illustrations. Signed by James D. Watson on the title page. Fine in a near fine dust jacket with a tiny closed tear. Jacket design by Jeanyee Wong. Foreword by Sir Lawrence Bragg. A superior example. Watson, James D; (Francis Crick). 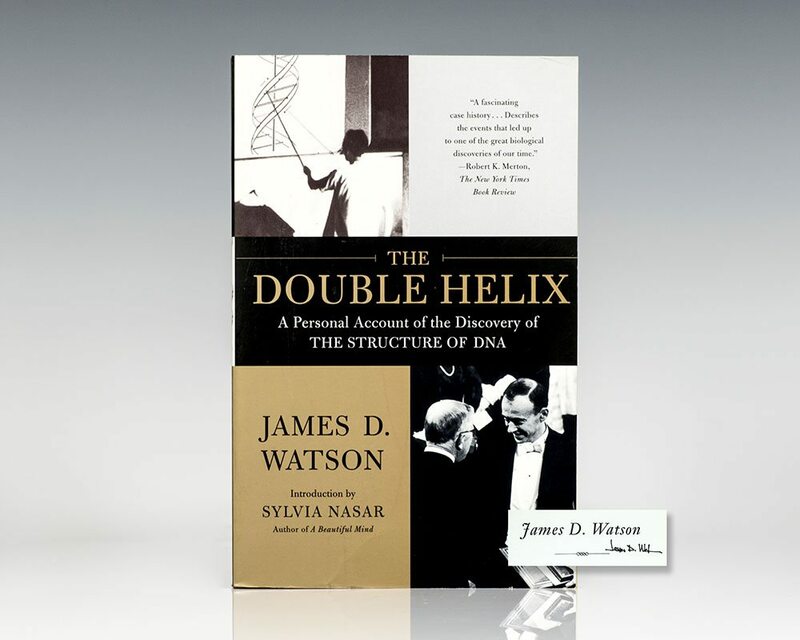 First edition of Watson’s ground breaking work regarding the discovery of DNA for which the author, Francis Crick and Maurice Wilkins were awarded the Nobel Prize in Medicine in 1962. Signed by both James Watson and Francis Crick on the title page. Octavo, original blue cloth, with numerous diagrams and photographic illustrations. Fine in a near fine dust jacket. Jacket design by Jeanyee Wong. Foreword by Sir Lawrence Bragg. Rare and desirable signed by both Watson and Crick. Housed in a custom half morocco clamshell box. Watson, James D.; (Francis Crick and Maurice Wilkins). First edition of Watson’s ground breaking work regarding the discovery of DNA for which the author, Francis Crick and Maurice Wilkins were awarded the Nobel Prize in Medicine in 1962. Signed by all three laureates on the title page, James D. Watson, Francis Crick and Maurice Wilkins. Octavo, original blue cloth, with numerous diagrams and photographic illustrations. Near fine in a near fine dust jacket. Jacket design by Jeanyee Wong. Foreword by Sir Lawrence Bragg. Housed in a custom half morocco clamshell box. 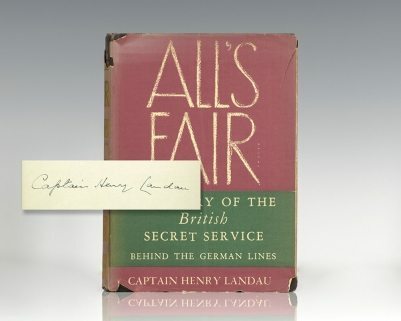 We have never seen another example signed by all three contributors; exceptionally rare. First edition of Watson’s ground breaking work regarding the discovery of DNA for which the author, Francis Crick and Maurice Wilkins were awarded the Nobel Prize in Medicine in 1962. Octavo, original blue cloth, with numerous diagrams and photographic illustrations. Association copy, inscribed by the author on the front free endpaper, “To Frank from Jim Watson.” The recipient was the late Ford Foundation sociologist Francis Sutton. Francis Sutton and Watson were at Harvard simultaneously and were close friends. Fine in a near fine dust jacket. Jacket design by Jeanyee Wong. Foreword by Sir Lawrence Bragg. Association copies seldom enter the market. First edition. Octavo, original illustrated wrappers. Signed by James Watson and also signed by scientist Edward O. Wilson on the front free endpaper. In fine condition. Watson, James D. (Francis Crick). Evolution of Catalytic Function: Cold Spring Harbor Symposia on Quantitative Biology. Cold Spring, NY: Cold Spring Harbor Laboratory, 1987. First edition of the collected speeches of the 52nd Cold Spring Harbor Symposia on Quantitative Biology. Foreword by James D. Watson. Quarto, original red cloth, illustrated with photographs, diagrams. Association copy, inscribed by James Watson to Francis Crick on the front free endpaper, “For Francis, the first of us to think sensibly as to what the Central Dogma tells us about the origin of life, from Jim, upon the 35th anniversary of the Double Helix. April 10, 1988.” Also signed by Francis Crick. A unique piece of history between arguably the two most influential scientists of the twentieth century, co-discoverers of the structure of DNA. In near fine condition. Housed in a custom slipcase. An exceptional association linking the discoverers of the molecular structure of DNA. First edition of Watson’s ground breaking work regarding the discovery of DNA for which the author, Francis Crick and Maurice Wilkins were awarded the Nobel Prize in Medicine in 1962. Signed by James Watson on the title page. Octavo, original blue cloth, illustrated with numerous diagrams and photographic illustrations. Some dampstaining to the cloth and a few pages in a near fine dust jacket. Jacket design by Jeanyee Wong. Foreword by Sir Lawrence Bragg. 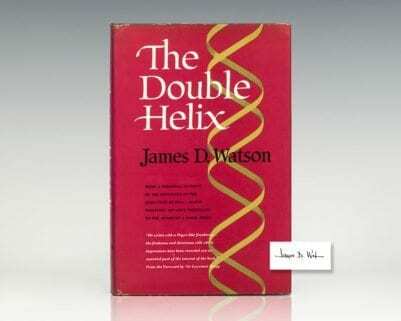 First edition, sixth printing, published a few months after the first of the Watson’s ground-breaking work regarding the discovery of DNA for which the author, Francis Crick and Maurice Wilkins were awarded the Nobel Prize in Medicine in 1962. Octavo, original blue cloth, illustrated with numerous diagrams and photographic illustrations. Signed by James D. Watson on the title page. Near fine in a very good price-clipped dust jacket with some wear and tears. Jacket design by Jeanyee Wong. Foreword by Sir Lawrence Bragg. Molecular Biology of the Gene. New York: W.A. Benjamin, Inc, 1965. 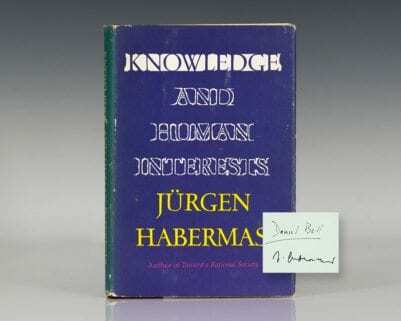 First edition of the Nobel Prize-winning scientist’s first book. Octavo, original illustrated wrappers as issued. Signed “J.D. Watson” on the title page (as his custom with this book, as that is how it appears on the title page). Editor’s foreword by Cyrus Levinthal. In very good condition. Uncommon signed.